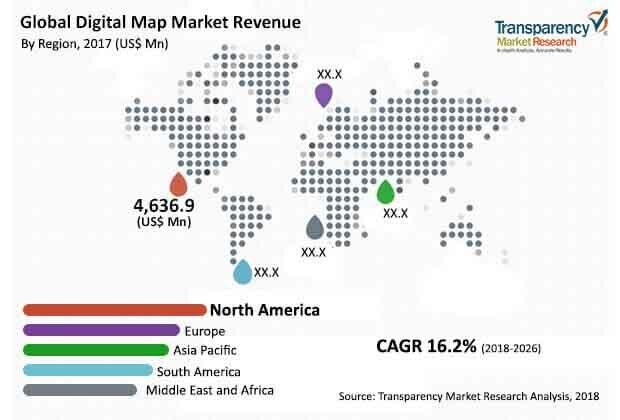 In a recent report by Transparency Market Research (TMR), the global digital map market is expected to witness a steady growth with the influence of industry specific and range of macroeconomic factors. The major factors for driving the market for digital map are increased digitalization, technical and technological advancements and rise in digitalization. Along with this, the usage of 3D platforms have also boosted market growth. With the rise of geospatial internet users and smartphones, there is incline in use of intelligent personal digital assistant or PDAs in both smart as well as portable devices. Adding to this, the prevalence of smartphones and growing usage of internet is also expected to increase revenue share of the global digital map market in the future years. Some of the leading players in the global digital maps market are Autonavi Software Co. Ltd., HERE Technologies, Environmental Systems Research Institute (ESRI), Apple Inc., and Google Inc. Major Players are focusing on providing more details on broad financial overview, recent developments, business strategies and company business overview. As per the TMR report, the global digital map market is presumed to display a 16.2% CAGR within the forecast period of 2018 to 2026. The valuation is anticipated to reach US$ 30.6 bn by the end of the forecast period. Owing to the inclining adoption of internet-enables portable devices along with smartphones and digital mapping in semi-autonomous and connected cars is likely to boost the market for digital map in the years to come. Adding to that, the number of digital map manufacturers have also increased. Post-sale service providing systems also led to the rising demand for digital maps across various regions. In terms of geography, the global digital maps market is likely to draw more revenue from Europe and North America. Both technological development and rising awareness among users regarding digital mapping amongst users are the factors leading to the increase in revenue of the digital map market from both North America and Europe. The market in South America is also not far behind. It is likely to second the revenue share to the global market. Besides, the market in Asia Pacific is also expected to see growth in the coming years owing to the developing nations. New technologies are being introduced and implied by the developing regions and this may further boost the growth of Asia Pacific at large. Apart from that, countries like Germany, U.K., France, Brazil and the U.S. are to provide lucrative opportunities to the global digital map making market owing to noteworthy investments in both autonomous and connected car industries. The market in Middle East and Africa is also likely to expand with an impressive CAGR in the years to come. With the advent of digital maps it is easier for end users to use digital maps for detecting locations. But there are a few restraints that may hinder the growth of the global digital map market in the long run. Data privacy concerns and mobile application security may impose restrictions on the use of maps digitally. Apart from that, the government and defense systems of various nations also does not allow complete access over digital map due to national security reasons. Digital maps solutions are basically used for defense teams for military operations and war fighting. This may be a major factor which may hamper the digital map market in the long run. The information presented in this review is based on a TMR report, titled,” Digital Map Market (Type - Software Solutions (Web-based, Desktop, Mobile App), Maps (data), Services; Application - Indoor Navigation/Positioning (Airports, Retail Stores (Hypermarkets/Supermarkets, Departmental Stores), Health Care Facilities, Others (Educational Institutes, Museums, Other Commercial Buildings)), Outdoor Maps (Automotive, Mobile & Internet, Government & Utilities, Real Estate/Construction), others (Energy & Mining, Agriculture, etc.)) - Global Industry Analysis, Size, Share, Growth, Trends, and Forecast 2018 – 2026”.